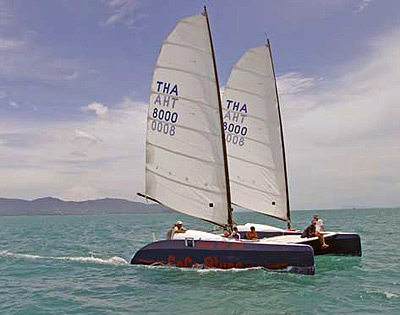 This Koh Samui sailing catamaran is a unique vessel mostly used for day charters on Koh Samui… if there is no sailing regatta happening on the island of Samui ;-). 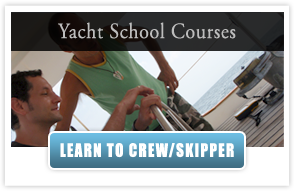 As a formidable vessel with excellent sailing performance she provides a real sailing experience to her guests who either can participate in sailing or just lounge on deck enjoying the quiet ride propelled by nothing else than the wind. 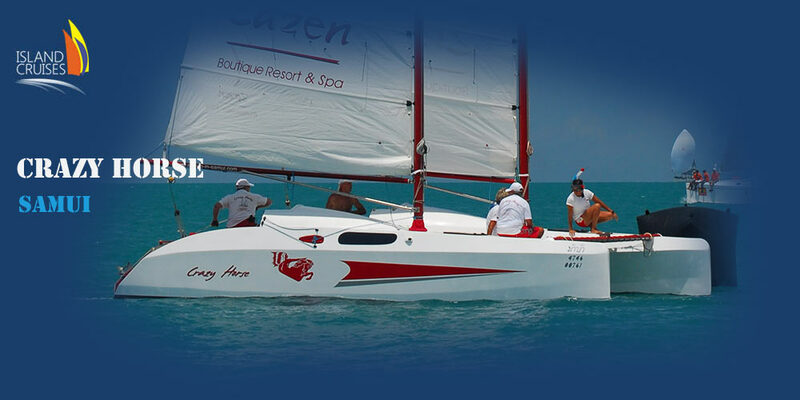 The SY Crazy Horse is a fast charter catamaran for Koh Samui sailing, of 27 ft length, providing ample space for up to 8 guests on day cruises. 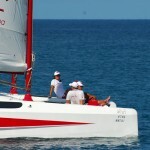 The SY Crazy Horse is a twin mast charter catamaran for a special sailing experience! 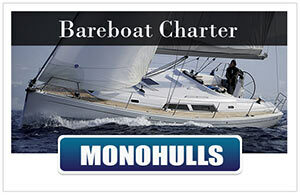 This charter boat is easy to handle and it is a winner in international regattas. We call her a ‘pure pleasure craft’ for 3-8 crew. 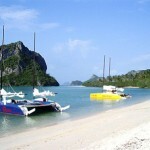 The SY Crazy Horse is designated for island hopping and sailing safaris in a tropical climate like here in Thailand. 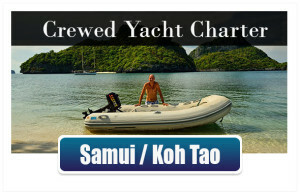 The SY Crazy Horse is also a great boat for shorter Koh Samui sailing trips, she is stationed in the north of Koh Samui, in Big Buddha. If you have a closer look at the Radical Bay 8000 design, you will find it to be an interesting concept for a small multi hull boat. 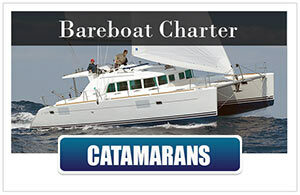 The size of this charter boat is 8m long and 5.78m wide and has a 0.3 m minimum draft. 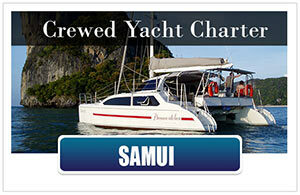 She is a perfect design for shallow bays, like you’ll find many, while sailing around Koh Samui. With a weight of less than 1100 kg, she has an easy and fast way of moving. With the small outboard engine she can also easily be driven fast, if needed. 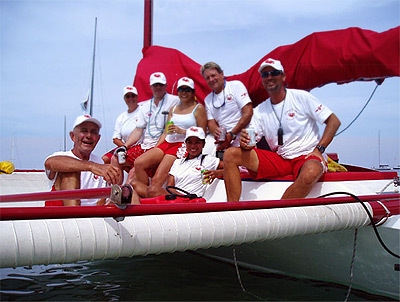 The Crazy Horse is a roomy boat for maximum 4 crew to sleep. She has a galley, a toilet and a storage room. The deck provides around 30 sq m! 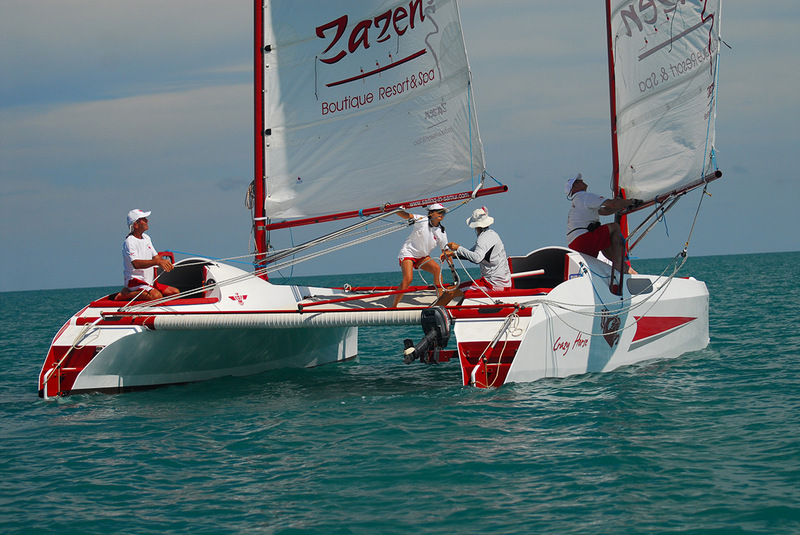 The bi-plane rig set up, means this boat has two free standing masts, one on each hull. This new rig set up is simple, effective, stable and safe… and very fast as well. 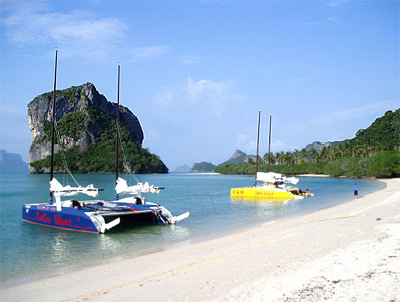 Island Cruises recommends this fast Charter Catamaran for active sailing on a daily basis or for overnight trips, to the Angthong Marine Park or to Koh Tao. Groups on overnight charters to the Angthong National Park will be accommodated ashore in bungalows or in tents, while the crew sleeps aboard the yacht to take care of things. Displacement 1100 kilograms Main construction material:”BalsaDuFlex”® panels and epoxy. Enjoy an afternoon of performance sailing with a stop over for snorkeling or just cruise into the sunset. Snorkeling gear and soft drinks included in the price. 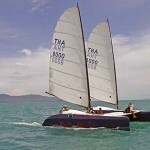 With this fast sailing catamaran we can manage to sail around the entire island of Samui or Koh Phangan in a day trip. You will stop at some beautiful bays for a swim and you will have lunch at an excellent restaurant serving some of the best Thai food you can imagine. Snorkeling equipment, lunch, soft drinks and transfer is included in the price stated below. 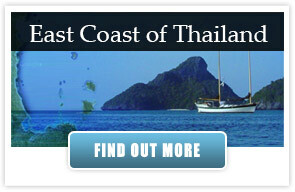 Explore Koh Phangan in two days time including water falls and view points. 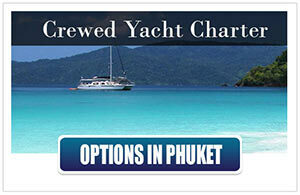 Accommodation ashore – there is something suitable for every taste and budget. 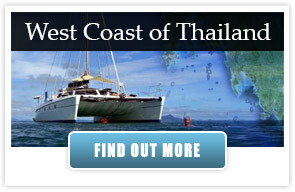 Including the famous full moon party in the itinerary is an option as well. 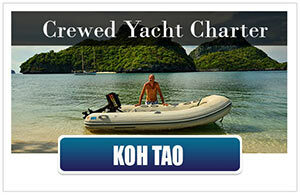 During 3 days you can have a look at the very best attractions the marine park or Koh Tao has on offer. Climbing view points, exploring caves and a stunning scenery are highlights of the Ang Thong National Marine Park while crystal clear waters with an abundance of marine life is the best what Koh Tao has on offer. Accommodation will be in bungalows ashore. 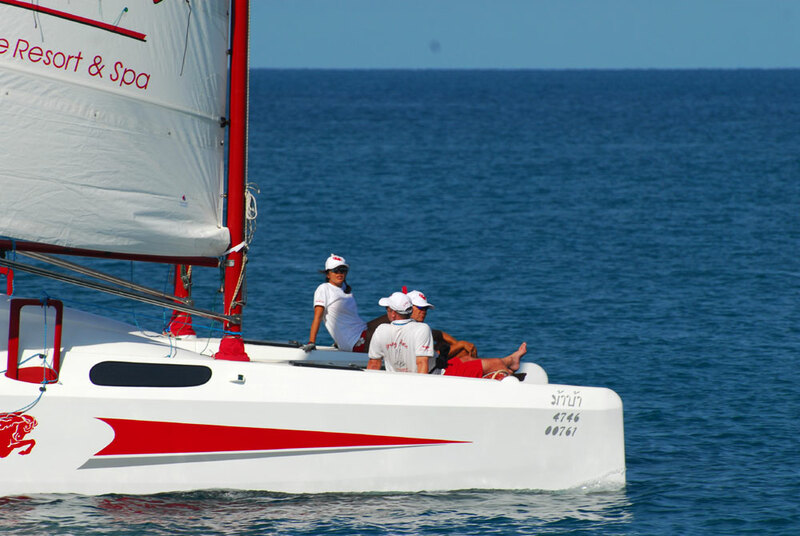 Due to the excellent sailing capabilities of this catamaran you can cover the entire western Gulf of Thailand area, as well known as the Samui Archipelago in a 4 day sailing adventure. Explore the best, these islands have on offer, with remote incredibly fine sanded beaches, stunning view points, tropical jungle water falls and wildlife. 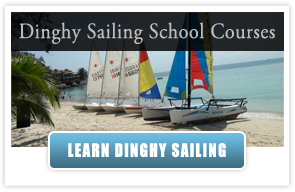 Live Aboard Thailand | Sailing Courses | The Freedom Fargo| Sailing in Thailand| Segeln Thailand | Adventure Sailing Cruises | Yachtcharter Boote Thailand More Charter Yachts in Koh Samui: Samui Sailing Vacation – Yachts & Catamarans. 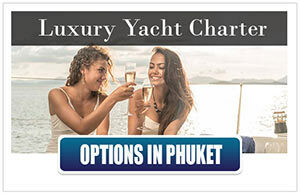 If you would like more details about the charter catamaran SY Crazy Horse or you maybe have an other question about Koh Samui sailing, or sailing Thailand, please don’t hesitate to contact us here.